We may rely on our phone for keeping in touch with friends and family, but there's some things they just can't do – from starting a fire to keep you warm in the wilderness, to charging your laptop and keeping your precious possessions safe at sea. We've rounded up some of the coolest keyrings that wouldn't look out of place on Bear Grylls' house keys, or should that be cave keys, as well as some clip-on gadgets to make life in the urban jungle that little bit easier. While few of us will ever experience the terror of being lost at sea, thank goodness, there's a fair chance we suffer the annoyance of our keys/camera/phone flying off a jet ski or boat on holiday. The Waterbuoy keyring is designed to save gadgets and important items from the briny depths. The tiny automatic flotation device can be clipped onto keys or devices and looks like a regular car key fob, until it's dropped into water when it inflates in seconds. It can do this thanks to an automatic actuator that releases gas from a tiny tank into a bright orange balloon, which breaks out of the end of the fob and inflates rapidly to the size of a melon. Capable of lifting objects up to 1kg to the surface, it will stay afloat for at least 24 hours and has an emergency flashing light to make it easy to find, even in the dark. So if your phone does fall over the side of a boat, there's no need for that sinking feeling. If James Bond needed to store some hi-res plans of a nuclear power station or incriminating financial records of an evil mastermind for his eyes only, he might choose this key ring. Kingston Technology's DataTraveler HyperX Predator USB Flash Drive is the size of a small lighter and is made with a durable metal casing. It holds an incredible 1TB of data. That's enough for 500 hours of movies or 17,000 hours of music or 310,000 photos. It also offers the fastest speeds, with 240MB/s read and 160MB/s write speeds in USB 3 – important if you're on a secret mission to extract information from a computer when the enemy's back is turned. It may be a rare occasion that our life depends on having a phone or laptop to hand, but it can certainly feel like it. While there are plenty of chargers available, they are usually heavy and bulky. But Fuel is the 'smallest' thumb-sized emergency back-up charger, weighing in at just 20 grams with a 400mAh internal battery to give an extra hour of talk time – and it charmingly looks like a jerry can. Users have to remember to charge it up using a USB cable, but they need only carry it on their key ring and plug it into their phone to feel the benefits. Of course, it could help explorers make an urgent phone call or let a spy send a critical email, but it would also be pretty handy when your phone's given up the ghost and you need to call a cab after a heavy night. If traipsing up and down supermarket aisles fills you with dread, there's a scanner for your key ring that could have you complete your grocery shop faster than the most enthusiastic competitors on Supermarket Sweep. Amazon's Dash gadget has just arrived in the UK and lets users add groceries to their basket by scanning them or by simply talking to the device and using it as a Dictaphone. Chosen items can then be delivered to their door using Amazon's grocery delivery service – although it's currently only available in a handful of London postcodes. The device learns as it is used, enabling it to recognise millions of products and if pronouncing tzatziki is too much, shoppers can simply scan items, either at home or out and about using the device's LED scanner, then order them when it's convenient later on. Sure, survival experts from the SAS may be able to light a fire to keep warm in any weather with just a couple of sticks. But for us mere mortals intent on having a barbeque even if it's blowing a gale, there's the Turboflame. Available in different styles, which are all able to clip onto a lanyard or keyring, the glorified lighter produces a blue flame reaching temperatures up to 1,300°C that's claimed to be windproof. The Turbo2 produces a twin laser jet flame, while the Military edition can last for 10 minutes and has a rubberised case. The company says its's ideal for sparking fire lighters in seconds in 'the worst weather conditions' and the gas-powered lighters can even be used to fix cracks in canoes, cut and seal rope and blast rust from metal – making it one hot gadget for survival geeks. If losing your keys or wallet is a frequent annoyance, the Tile keyring could help – and it's even been used to find stolen bikes and items on a trek across Antarctica. The Bluetooth tracker can be attached to your keyring - or anything you don't want to lose. With the help of an accompanying phone app, users can ring lost items - providing they're within a range of 100 feet - and show the last location of a Tile on a map. If this is no help, there's a community that can expand the search area too. Because the gadget doesn't rely on Wi-Fi, it can be used in seriously remote locations – on an iceberg in Antarctica for example. A team of explorers used the gadget to locate items left on a boat, but it could simply save you time looking for gadgets before work every day. 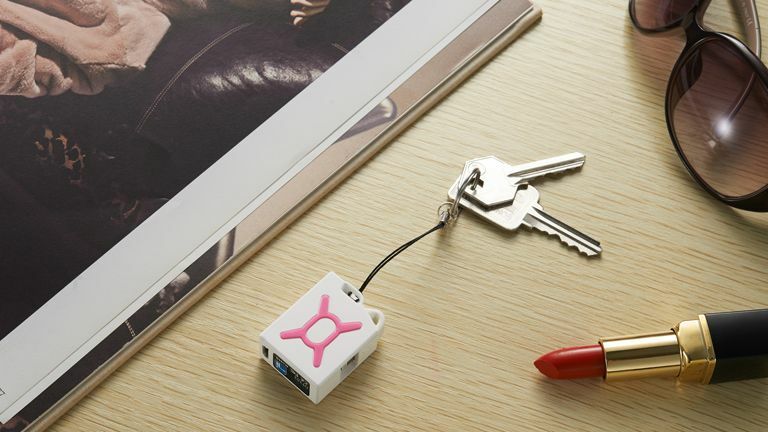 A first glance it looks like a standard key, but if you look again, it's actually a key-shaped USB cable designed to charge a phone or tablet. The Chargekey is made from rubber and silicon so it can be bent and twisted, as well as withstanding knocks in your pocket or bag. The connectors are designed to be scratch-resistant without covers, and there's no annoying wires to get tangled with your headphones. Charging a phone is as easy as clipping it onto the keyring, which links to a computer, wall charger or battery pack. It's available with a Micro USB or Lightning adapter for Android and Apple devices.